Lot of 12 issues of this long-running Street & Smith pulp—a run from August 29 to November 21, 1942. All the major contributors and recurring characters represented, some in multiple issues. 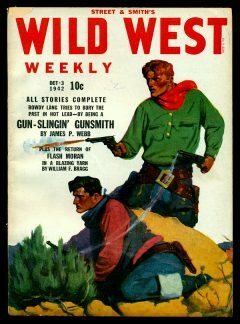 Most covers are reprints from mid-Thirties issues by R. G. Harris. Average condition is Very Good/Very Good Plus but a few grade slightly lower. Better than reading copies, certainly. PRICE INCLUDES SHIPPING AND HANDLING TO DOMESTIC U. S. BUYERS. NO INTERNATIONAL BUYERS.